Many businesses need to do more than just create and edit PDF. They need PDF security that ensures regulatory compliance and corporate governance of their important documents and archives. They also need to ensure certified documents don't change after they are approved. It is essential to have a robust PDF solution that stands up to the demands of large enterprises but is lightweight enough to easily deploy to thousands of users without exhausting resources. 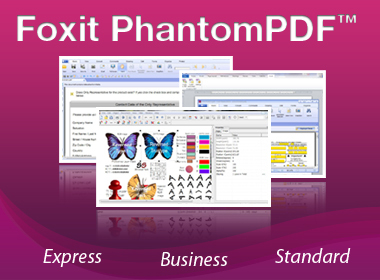 Foxit PhantomPDF Business delivers Business Ready PDF by providing the right features (like edit PDF, protect PDF, create PDF, and more) at the right price with the quality and support you expect from an enterprise solution. delete pages, add pages, and assemble a new PDF document. Easily shares PDF content with other applications, like Microsoft® Office. encryption, and digital signature tools. control of document features within each PDF. based content into selectable and searchable text. Bates Numbering - Used for document identification and protection. PDF Optimizer - Optimizes PDF document to reduce the file size. Email and Phone Support - helps when you need it.